← The party is over. 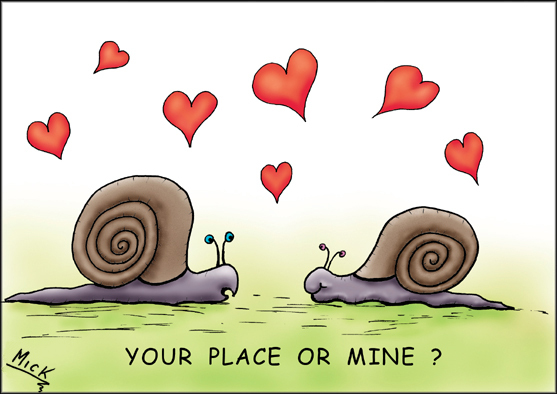 House training a couple of pet snails can be frustrating, especially during the mating season. They’re slow to react to commands and will rarely look you in the eye when you’re talking to them. On the plus side, they don’t swear at you and are easy to clean up after. But snails are nowhere near as frustrating as house training a politician. Yes, in the not too distant future, the House of Representatives will again be full of politicians, and the lack of training will, once more, be very evident. They’ll shout and abuse each other, spin the facts until they are just a blur, talk over others, sleep in their chairs, txt rude comments around the House, make bad decisions, run from the House attempting to avoid voting, and behave devious in general. Not all of them, but most. And the crux of the problem is they have never been trained for the job. We train doctors, lawyers, plumbers, pilots, carpenters, accountants, train drivers and so it goes. But those vested with the responsibility of running our country are not trained to do so. Those who sound the most convincing get the job, regardless of their ability to actually perform as a politician. So how do we train them to perform? We don’t. It would be a total waste of time and money, as most politicians are focused solely on their own political career and survival. All their energy is absorbed in self-preservation and survival of their species. Posted on September 15, 2013, in Cartoon, illustration, humour, humor, caricature, political, art, Australia, Perth, cartoonist, Illustrator and tagged Australia, Australian, Cartoon, cartoonist, cartoons, Government, humor, humour, illustrator, Perth, Political, Politicians, Politics. Bookmark the permalink. 5 Comments. …. and they’re easy to keep up with. Ahh yes, good ol’ Turbo. That guy just has too much energy.